WARNING! You’ve Been Exposed to New Prop 65 Requirements! Alameda County Bar Association > General > WARNING! You’ve Been Exposed to New Prop 65 Requirements! By Wendy Manley, Esq. and Summer Nastich, Esq. We’ve all seen them. Those dire warnings provided pursuant to California’s Safe Drinking Water and Toxic Enforcement Act of 1986 (Health & Safety Code § 24000 et seq. ; aka “Proposition 65” or “Prop 65”) and the associated regulations (27 CCR § 25102 et seq.). We stare at them in jet ways, parking garages, coffee shops, and taco stands throughout California. They tell us the very area in which we are standing, or the product we are about to consume, “contains chemicals known to the State of California to cause cancer, birth defects, or other reproductive harm.” In fact, we’ve seen them so often we hardly notice them anymore. Ostensibly, in part because we’ve all become so numb to them, the words of these warnings and how they must look changed on August 30, 2018. As a result, in almost every case, the old, generic signs Californians know so well will no longer suffice to protect required-warning providers from Prop 65 liability. The idea behind Prop 65 is that if people have enough of the right information, they can choose whether to expose themselves to chemicals that cause cancer, birth defects, or other reproductive harm. Prop 65 therefore requires that entities to which the law applies—any business (generally manufacturers, distributors, retailers, and certain property owners) with ten or more employees—to warn people before exposing them, in the course of doing business, to any of the 900-plus chemicals identified by the state as causing cancer, birth defects or other reproductive harm, or both. The warning(s) must be “clear and reasonable.” If a “clear and reasonable” warning is given, the entity enters Prop 65’s “safe harbor,” and should have a complete defense to liability under Prop 65. The new regulations that kicked in on August 30, 2018 set new requirements for the language, content, and methods of conveying the warnings necessary to bring entities within this safe harbor. Scofflaws that stick with the old signs or, worse, fail to provide any warning at all, risk governmental or citizen enforcement and the associated—potentially staggering—fines and penalties (up to $2,500 per chemical, per person, per day of exposure, plus attorneys’ fees to the prevailing plaintiff, but not the prevailing defendant). For some, compliance with the changes requires no more than a straightforward revision of the prior warning(s). Others face a more nuanced exercise of examining what chemicals they might expose people to and then figuring out their warning obligations. The hopes for this article are (1) to offer a general overview of the new requirements, (2) identify those aspects of the new requirements that seem clear from the surface, but get awfully murky when one dives in (and will likely remain so until clarification by the courts, legislature, or agencies), and (3) provide some perspective (but definitely not legal advice) on how entities might handle the murky bits. Prop 65 creates a “safe harbor,” which is where any entity to which the law applies wants to anchor. Outside of that safe harbor, entities are vulnerable to enforcement and resultant liability for violating Prop 65. In order to enter Prop 65’s safe harbor, the warnings provided must be “clear and reasonable” (read: “as set out in the regulations”). Although this is an ironically vague standard at best, the revisions to Prop 65 establish specific warning content and methods for transmitting those warnings, that, when followed, establish that the warning is “clear and reasonable” for Prop 65 purposes. While using the specified content and warning methods is not required, alternative approaches are vulnerable to challenges that the warning is unclear, unreasonable, or both. Where Prop 65 is concerned, there is little to be gained from editorializing the warning content or second-guessing the methods of providing the warnings set out in the regulations. But, take heed, while an entity that provides the required warning(s) can expose people to as many Prop 65 chemicals as they want all day, every day, without significant risk of Prop 65 liability, providing a compliant Prop 65 warning does not necessarily affect an entity’s potential toxic tort liability if the exposure actually makes someone sick. The warnings only address potential liability under Prop 65—they do not address any other sources of liability for exposing people to toxins. For most, the old warning requirement consisted of notice of the presence of chemicals known to the state of California to cause cancer, birth defects, or other reproductive harm. The revisions to the warning requirements are, in part, an effort to provide more meaningful information about the presence of these chemicals in consumer products and certain environments. What follows in this section is an overview of the new requirements for warning wording and content. Charles v. Sutter Home Winery, Inc., 23 Cal.App.5th 89 (2018), cited above, is one of the first cases to consider the revisions to Prop 65. One of the questions the case was whether Prop 65 obligated defendants to include a warning specifically for the arsenic present in their wines, despite the fact that they provided the required warning for alcohol. The court concluded that, because the wine-specific warning informed consumers of all of the possible risks, i.e., both cancer and reproductive harm, that warning was sufficient— regardless of the number or nature of any other Prop 65 chemicals also in the wine. So, because defendants provided the required warning for alcohol, a warning for the arsenic was unnecessary. As noted above, this holding indicates that the Acme Widget Company can choose to provide either one warning for Chemical 3 and both endpoints, or both Chemicals 1 and 2 and the respective endpoint for each. Warnings must now also include a reference to the new Prop 65 webpage that contains a searchable chemical database and related information for consumers (that website is www.P65Warnings.ca.gov). This widget can expose you to chemicals known to the State of California to cause birth defects or other reproductive harm including acetaldehyde and mercury. For more information, go to www.P65Warnings.ca.gov. The revisions also give the warnings a new look. Now, a specific symbol must be included: a yellow, equilateral triangle (God have mercy on those poor souls that employ an Isosceles triangle!) with a black outline containing an exclamation point (there are some exceptions to this color scheme, if not the presence of the symbol). The word, “WARNING” must also appear in bold, all caps next to the triangle/exclamation point symbol. There are also specific requirements for minimum font size and the languages in which the warnings must be printed (check the regulations for specifics). WARNING: This widget can expose you to chemicals known to the State of California to cause birth defects or other reproductive harm including acetaldehyde and mercury. For more information, go to www.P65Warnings.ca.gov. The revisions prohibit the inclusion of other, “supplemental,” information in the warnings (though what might constitute such “supplemental information” is not at all clear). The warnings can only include the source of exposure and information on how to avoid or reduce the exposure. A warning that includes impermissible “supplemental” information (again, whatever that is) loses the otherwise automatic safe harbor protection that should result form giving the warning. 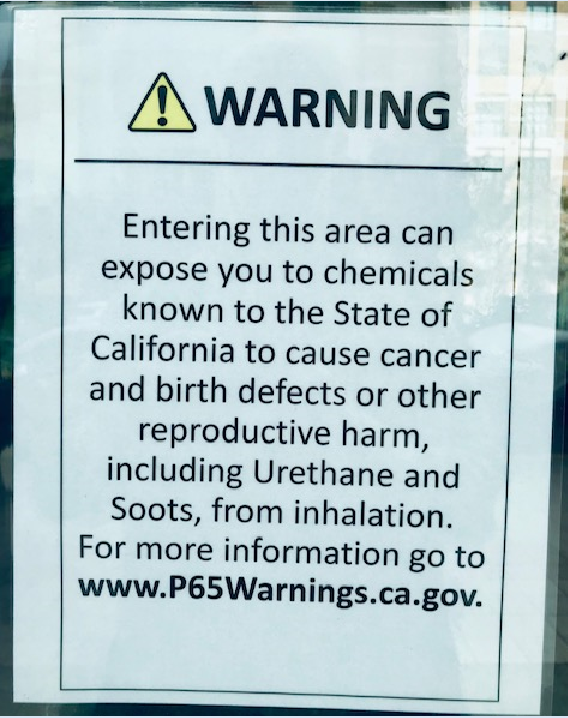 Based on all that you just read, can you tell if the photo [right], which one of the authors took of a Prop 65 environmental warning posted on an office building downtown Oakland is actually new-Prop 65 compliant? It clearly satisfied the requirement for the triangle/exclamation point symbol, it’s got the right color scheme, the font size seems ok, and it lists chemicals as opposed to brand names. All good stuff. We read this as the sources being “ambient air, indoor air, drinking water, standing water, running water, soil, vegetation, or manmade or natural substances or objects” and the routes being “inhalation, ingestion, or skin or other contact with the body.” If we’re reading the section correctly, the warning in the photo fails to provide the sources of the exposures as required by 27 CCR § 25605(a)(5), which states the following as the safe-harbor giving text for environmental exposures. Another possible issue is that one of the chemicals at issue is actually in the Prop 65 list as “Urethane (Ethyl carbamate),” not just “Urethane,” as it appears in the warning in the picture. It is therefore possible that the warning is incomplete, and thus (at least arguably) unreasonable or unclear. Finally, we point out that Urethane (Ethyl carbamate) is listed as both a carcinogen (at certain levels) and a developmental toxin. That being the case, if the concentration is high enough the warning could have named Urethane (Ethyl carbamate) only, as long as it also identified both cancer and developmental toxicity as endpoints. The revisions to Prop 65 also set out methods for communicating the required warning(s) that should automatically bring the warning-provider into safe harbor. These methods include on-product labels, product-specific shelf signs displayed where the products are displayed, and product-specific warnings provided by electronic devices or processes (such as QR codes). For internet sales, product-specific warnings or hyperlinks to warnings must be provided prior to purchase, even if the product is labeled with a warning. Similarly, warnings in catalogs must be provided in a manner that clearly associates the warning with the specific product to which it applies. There are also specific requirements for those choosing to provide the warnings by publication or mail. In every case, to take the benefit of safe harbor, the warning methods must meet all of the specific details set out in the revised regulations. The revisions to Prop 65 substantially expanded the number of situations in which a specific warning must be given and/or warnings must be given in a specific way. These categories now include dental care, wood dust, furniture, diesel, vehicles, recreational vessels, enclosed parking facilities, amusement parks, petroleum products, designated smoking areas, service stations, vehicle repair facilities, restaurants, and hotels, in addition to alcohol and food. To be compliant, the warning for any of these special situations must incorporate the specific content and warning method provided in the regulations. For example, food warnings provided on packaging must appear within a box, though they need not display the triangle symbol. And restaurant warnings must include specific language about acrylamide, a chemical found in “many fried and baked foods,” as well as mercury in fish. One of the challenges with the new, tailored warnings is trying to determine whether or not they apply. For example, there are tailored warnings for “enclosed parking garages,” but no guidance on what constitutes an “enclosed parking garage.” Is a ceiling all that is needed to constitute an “enclosed parking garage” such that most carports would qualify, or are walls necessary? What about those parking structures where two sides are only half walls? A are those “enclosed parking garages”? Another example is the specific warning applicable to “vehicle repair facilities.” Prop 65 doesn’t define “vehicle repair facilities.” Do brake shops count? Quick lube shops? These are questions neither the law nor the regulations answer. This uncertainty, coupled with the prohibition on supplemental information—an attempt to thwart the over-warning that occurred prior to the addition of this prohibition (where everyone would post a sign just in case)—creates a damned-if-you-do, damned-if-you-don’t situation for entities that do (or do not) have to provide a tailored warning: Provide both the tailored warning and a general warning to cover all your bases, and risk blowing yourself out of safe harbor by including prohibited supplemental information if only one warning is required (since we don’t know if that would be prohibited supplemental information or not), or post one just one warning and risk liability if the other is, or both were, necessary. This probably isn’t what Yoda had in mind when he said, “do or do not, there is no try,” but it sure seems to fit. In addition to those flagged above, the new requirements seem to present myriad other challenges for persons in the course of doing business. A rose by any other name is just as deadly, and more likely to get you sued. WARNING: Entering this area can expose you to chemicals in indoor air known to the State of California to cause cancer and birth defects or other reproductive harm including ABC Aerosol Spray and XYZ Carpet Cleaner. For more information, go to www.P65Warnings.ca.gov. WARNING: Entering this area can expose you to chemicals in indoor air known to the State of California to cause cancer and birth defects or other reproductive harm including tetra-methol-death and 1,4-gonnakillusall. For more information, go to www.P65Warnings.ca.gov. But, take heart warners! In addition to making compliance with the law more likely, warning of the actual, listed chemical(s) is also preferable as a practical matter because it eliminates the need to revise the warning(s) every time you change brands (assuming, of course, that all brands of the same kind of product contain the same chemical(s) of concern). Oh, no, you’re not done. Another challenge (and it’s an on-going one at that), is the need to continually assess whether, and what, Prop 65 chemicals an entity might expose people to in the course of doing business. The old warnings allowed for easy compliance—the generic warnings worked in all situations, signs could be bought off the shelf for a nominal price, and slapping one on the wall or a package brought the warning party into safe harbor. Set it and forget it. But now the carcinogenic chemicals and/or reproductive toxins to which an entity is exposing people must be specifically identified (and naming one you don’t use anymore could be supplemental information that costs you safe harbor), as must the source of the potential exposure in some instances (and, again, it’s unclear if the source changes but the signs don’t whether warning about the former source is prohibited supplemental information). As a result, the conservative approach is for business subject to Prop 65 to not only initially evaluate their products and facility to determine whether they will expose people to one or more listed chemical(s) and the harm that any identified chemical might cause, but to continually monitor the contents of the products they make, sell, and/or use in their facilities, and ensure that their warnings track any changes to the formulation or composition of these materials. Another challenge is that the requirements for sign text be at least 72-points, possibly be written in multiple languages, and include a symbol, means it may be impossible to fit all of the required material on a single sign. Businesses are therefore having to purchase multiple, custom made signs, which means greater expense and a lag time between order and receipt. Remember, these requirements were effective August 30, 2018. Procrastination could be costly! As noted above, Prop 65 only applies to business with at least ten employees—smaller entities don’t need to comply. There’s also a specific exemption for entities providing warnings pursuant to a court-ordered settlement or a final judgment to which they were a party. As long as the warnings are consistent with the language set out in the settlement or judgement, the warnings are deemed clear and reasonable. Which means that, in some cases, the old-style warnings will still be good enough. In an effort to ease the burden on retailers, the new requirements attempt to limit their warning responsibility to certain circumstances. Specifically, retailers must only provide warnings where (1) the product at issue is the retailer’s brand or trademark, (2) the retailer introduces or causes the creation of a listed chemical in a product, (3) the retailer and supplier contractually agree to allocate responsibility for provision of the warnings to the retailer, or (4) the retailer receives notice of the warning requirement from the manufacturer, importer, distributor or other supplier in accordance with the regulations. Manufacturers and distributors should note, however, that they are not relieved of responsibility (and potential liability) in relation to the warning requirement just because the retailer must also provide a warning. Rather, these situations merely obligate the retailer to pass the warning through to the consumer. Now that August 30, 2018 has come and gone, most business with ten or more employees should already be providing more extensive and more specific Prop 65 warnings than before that date in order to avoid a possible enforcement action. We are also in the midst of an equilibration period when courts wrestle with some of the open questions, and who knows how long that will last? So, and we realize this may not be particularly insightful, entities subject to the law that want to take the benefit of the safe harbor protection should do their best to comply with the letter of the law—without embellishment or editorialization. They should also be sure to follow the anticipated cases as they work their way through the courts and adjust their warnings in light of any published decisions by the Courts of Appeal. Article – WARNING! : You’ve Been Exposed to New Prop 65 Requirements! CLE Program – Could PFAS Bankrupt Your Business? Article – Could PFAS Bankrupt Your Business? ﻿Could PFAS Bankrupt Your Business?